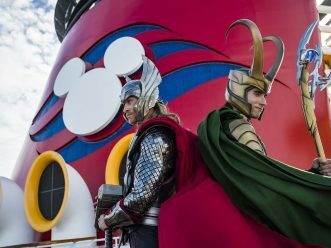 CELEBRATION, Fla. – With the Disney Fantasy and Disney Dream, Disney Cruise Line takes cruise ship entertainment to new heights. Performers soar and surf over the stage in aerial maneuvers. Pirates rappel from atop the ship’s funnel during a swashbuckling adventure. The evening sky lights up with a dazzling display of sound and color. 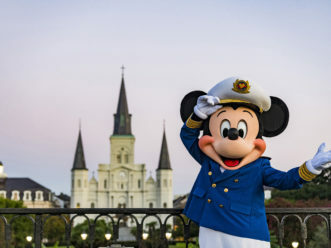 Disney Cruise Line develops entertainment designed to charm and dazzle the entire family. Guests delight to the most elaborate original musicals presented at sea, over-the-top deck parties and, bursting above it all, a nighttime fireworks spectacular. 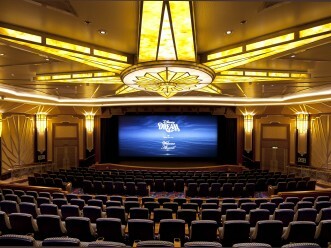 Every night is show time at Walt Disney Theatre, an elegant 1,340-seat entertainment palace that spans three decks with orchestra and balcony seating, and is resplendent with art deco styling recalling luxurious show places of a bygone era. 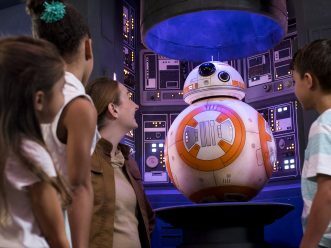 At the same time, it is equipped with theatrical technology that makes it one of the most advanced venues on land or sea, bringing original productions and Disney stories to life in a whole new way. 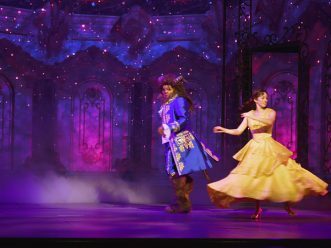 “Beauty and the Beast” brings Belle’s enchanting adventure to the Walt Disney Theatre stage in a whole new way by incorporating imaginative elements from the live-action film and the classic animated feature. Guests are invited to experience this tale as old as time like never before, as they are whisked away on a magical journey to discover the power of transformation in this Broadway-style musical. This unique retelling features beloved classics like “Something There” and “Beauty and the Beast,” with “Be Our Guest” being completely reimagined to include stunning visual effects and impressive choreography. New musical masterpieces are also introduced to the stage for the first time, as guests will recognize “How Does a Moment Last Forever” and “Days in the Sun” from the live-action film. In this new interpretation of “Beauty and the Beast,” guests are transported to Belle’s provincial town and Beast’s magnificent castle through a combination of high-definition projections, dynamic scenery and a little bit of Disney magic. Beloved characters like Lumiere, Mrs. Potts and Cogsworth are realized in an unprecedented way, using innovative puppetry and elaborate costumes to bring these characters to life in their true scale. “Disney Wishes” is a musical journey about three best friends who discover the secret to being a grown-up is staying connected to their inner child. The story begins as best friends Kayla and Nicole along with Nicole’s twin brother Brandon visit Disneyland to celebrate their high school graduation. Unsure of what the future holds for them, they make a wish to go on the “Ride of Our Lives”—the show’s original opening number. Their wish evokes an enchanted world where a cavalcade of Disney characters—including Rapunzel, Flynn Rider, Lilo, Stitch, Mulan, Hercules, Pinocchio, Timon and Pumbaa—materialize to guide the teens through their magical journey. In an over-the-top musical comedy production number, the song “I’ve Got a Dream” from “Tangled” sets the scene as the Snuggly Duckling Tavern comes alive with Rapunzel, Flynn Rider and a tavern full of hilarious thugs. In the “Hawaiian Roller Coaster Ride” scene inspired by “Lilo and Stitch,” the stage fills with giant windsurfing sails, kites and surf boards. The infectious music inspires Kayla as she rides a surfboard, flying atop a giant blue wave silk. In the final act, the trio celebrates their extraordinary journey as the pop tune “Breakthrough” from the Disney Channel original movie “Lemonade Mouth” keeps the revelry going. Classic scenes and songs from the movie are re-created on stage—and some of the action even spills out into the aisles, like Prince Ali’s jubilant arrival in Agrabah on the back of a stallion. Magic lamps, wise-cracking genies, princesses and evil wizards are all part of this musical production. 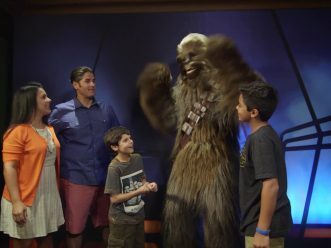 “A Fantasy Come True” is a 45-minute, high-energy, multimedia musical production that follows one family’s journey as they discover the amazing experiences and enchanting surprises that await them aboard the Disney Fantasy. Ultimately, they learn the greatest experience the ship has to offer is the opportunity to make memories—together as a family—that will last a lifetime. 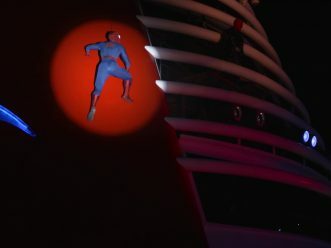 “An Unforgettable Journey” is a good-bye hug in the form of a 45-minute musical production that allows guests to reflect and savor the experience they have had onboard the Disney Fantasy. This farewell show connects the guests’ experiences to the man who started it all—Walt Disney—through audio and video clips that steep the memorable moments and distinctly Disney touches in Walt’s words and wisdom. In addition to nightly stage productions, Disney Cruise Line brings the upper decks of the Disney Fantasy and Disney Dream to life with incredible live entertainment. The fun begins with “Sailing Away,” a “welcome aboard” show starring Mickey Mouse, Minnie Mouse and the Disney gang. 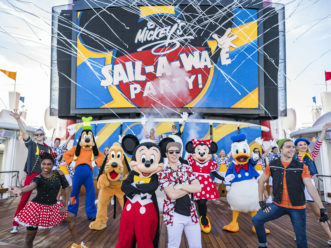 The show is a celebration of the fun aboard a Disney cruise. 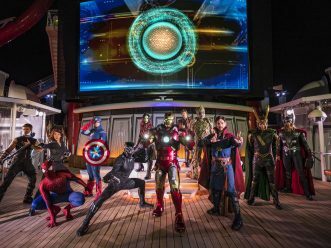 During a special night of each cruise, the Disney Fantasy and Disney Dream transform into a pirate ship with a night of events brimming with buccaneer fun and a fireworks spectacular. The evening kicks off with “Mickey’s Pirates IN the Caribbean,” a family-friendly interactive show featuring the famous Disney characters. Guests become members of Mickey’s Pirate Crew as they participate in a series of pirate-themed musical numbers. Later in the evening, Jack Sparrow from the “Pirates of the Caribbean” films makes a special appearance on deck in “Hunt Fer Jack,” a thrilling live-action pirate showdown which culminates in “Buccaneer Blast” —a spectacular display of piratical pyrotechnics. Disney Cruise Line ups the entertainment ante and lights up the sky with a fireworks extravaganza like only Disney can do. As part of the pirate night celebration, the skies above the Disney Fantasy and Disney Dream explode with brilliant colors during “Buccaneer Blast.” With more “bang” than ever before, the pyrotechnic spectacular is choreographed to a dramatic score featuring songs from the “Pirates of the Caribbean” movies.